Rice University has been awarded a $1 million grant by the W.M. Keck Foundation to develop gas-releasing microbial sensors for the study of soil and marine life. The grant is in support of the work of biogeochemist Caroline Masiello, biochemist Jonathan Silberg, microbiologist George Bennett, synthetic biologist Matthew Bennett and graduate student Shelly Cheng. They said too little is known about microbe-driven processes that play key roles in regulating Earth's environment. Microbes affect soil development, water quality and crop yields, and they also mediate global carbon and nitrogen cycles. "Understanding how microbes behave in soil and marine systems is key to managing the challenges we face in climate, food and water," Masiello said. "This is going to help establish a new discipline where we combine Earth sciences with modern molecular tools," said Yousif Shamoo, Rice's vice provost for research and a professor of biochemistry and cell biology. "It's going to be an emergent field and its influence stretches from molecules to a planetary scale. This is a new area, not just for Rice, but in general." Since the discovery of natural and engineered green fluorescent proteins in the 1960s, researchers have used them to observe biological processes like the proliferation of cancer cells. However, fluorescent proteins only work in biological systems that offer transparency, like a petri dish. Fluorescent proteins can't be detected through soil or marine sediments. The Rice team is engineering a new class of biosensors—genetically modified microbes—that report to researchers when they make a specific biochemical decision by releasing an easily detected gas. 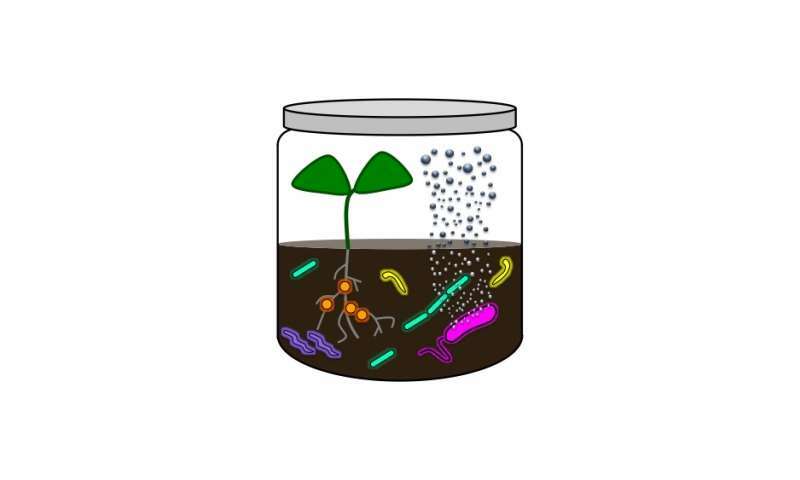 The goal is to program organisms to either "blog" about their behavior in complex environmental settings like soils, or to "spy" on the behavior of other microbes. The researchers plan to use these biosensors in the laboratory to study how microbes influence systems from protein to planetary scales. "This started when Carrie said, 'You know, biogeochemists and ecologists don't usually measure microbial processes with a microscope,'" Silberg recalled. "'They measure gases. They measure carbon dioxide coming out of incubation chambers in their laboratories. We need a gas.'" "I thought, 'Gas! Nobody does that.' That's when we realized nobody is doing the right kind of measurements in soil. It was a kind of wacky idea, but then we started to dig into it and realized it was feasible." Silberg expects the new tools will bridge the interests of Earth scientists, ecologists and synthetic biologists. "We are creating a new way to study environmental processes in the laboratory. These sensors will allow researchers to study the complexity of the environment in a laboratory or greenhouse setting. There, we can leverage synthetic biology tools to find answers," he said. The researchers plan to offer a summer course on their techniques for scientists from other institutions. Masiello said metagenomics—the study of genetic materials derived from environmental samples containing many organisms—allows ecologists, soil scientists and oceanographers to get snapshots of microbial communities. "Omics has been incredibly powerful in generating hypotheses about how microbes control environmental processes," she said. "Our sensors will make it easier to test metagenomics-generated hypotheses." She said researchers will be able to build model ecosystems in the lab that enables them to study whether changes in an environmental condition trigger these microbes to do something. "The genetic code that we're funded to build here will allow the introduction of synthetic circuits into these microbes to report back if they are or are not responding in a particular way," Masiello said. "It's a tool we hope will be broadly useful to many people who are currently using omics." The researchers will first develop and optimize microbial sensors that function like the "paintbox" of fluorescent reporters used by biologists. These sensors will report on dynamic biological behaviors. They will also develop tools to read the sensors and perform proof-of-concept experiments before ultimately building a suite of sensors for many purposes. The Keck Foundation, located in Los Angeles, funds projects that promise far-reaching benefits for humanity, including science, engineering and medical research and undergraduate education.